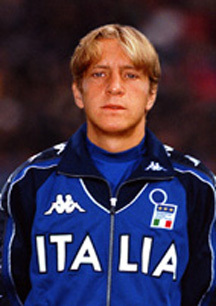 Here's Massimo Ambrosini,italian from region Marche that's down region Emilia Romagna. 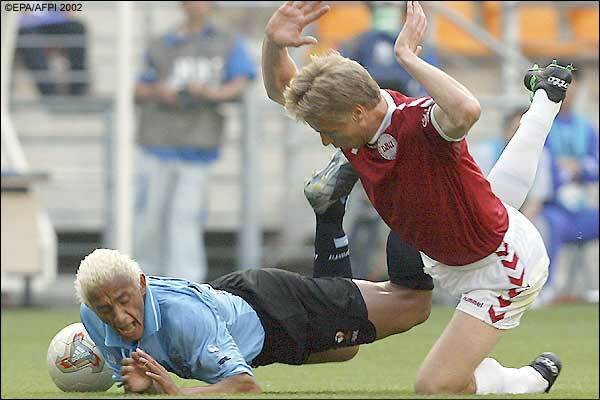 I would say, the Ambrosini is Noric, the Laursen is Faelid? I tried to find some more pics. 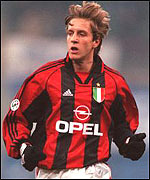 I maintain that Ambrosini is Noric or fair Dinaric, and Laursen is Falish. You said that Ambrosini is from Emilia Romagna and fit to the type you can find in Bologna (Dinaric with a Nordic minority). "In the population of the Bolognese there is a strong prevalence of Alpine and Dinaric types, especially the former, but approximately one-third of the population is long-headed or nearly so. Among this third, Nordics are not uncommon, but the most important element is a tall, slender, brunet, long-faced type, with a thin, straight or convex nose, and thin lips. It is a variant of the Atlanto-Mediterranean, with some of the Cappadocian facial features brought from western Asia by early navigators, including the Etruscans. Associated with this type is a frequent obliquity of the eye slits, which are very long; highly arched eyebrows and full malars." No, he's is grabbing Zinedine Zidane a French soccer player. The Danish player is a cross between Luke Skywalker and Chewbacca.